Malaria, osteoporosis, cancer, lung and kidney disease were just some of the areas of pioneering medical research carried out in Scotland highlighted by the ‘2017 Meet the Researcher Showcase’, staged at Dundee Science Centre for the second time. 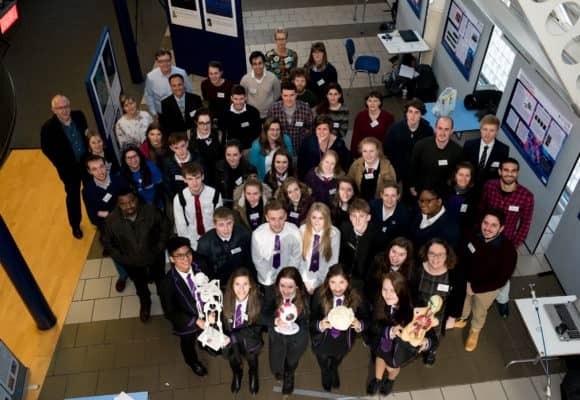 The event was the latest in the Meet the Researcher Showcase series delivered by Medical Research Scotland, with the aim of informing and enthusing senior school pupils about medical research and the wide range of careers open to them. Pupils and teachers enjoyed careers talks from Professor David Harrison, John Reid Chair of Pathology, University of St Andrews and Dr Morag McFarlane, CEO Tissue Solutions Ltd.
Pupils also engaged with exhibitors who used innovative and fun ways to relay research on parasites, drug design and endoscopes from the University of Strathclyde, the University of Aberdeen Marine Biodiscovery Centre and the Institute for Medical Science and Technology (IMSaT). Schools represented at today’s ‘Meet the Researcher Showcase’ were: Westhill Academy, Aberdeenshire; Morgan Academy, Dundee; Auchmuty High School, Glenrothes, Fife; The Waid Academy, Anstruther, Fife; Breadalbane Academy, Aberfeldy, Perthshire; St John’s Academy, Perth; Strathallan School, Perth. Medical Research Scotland is one of Scotland’s largest, independent charitable funders of medical research. Originally established in 1953 by Act of Parliament as “The Scottish Hospital Endowments Research Trust”, it became a fully independent Scottish charity in 2006 and is now known as “Medical Research Scotland”. Her Royal Highness The Princess Royal has been its Patron since June 2008 and its Chairman is Professor Philip Winn. Medical Research Scotland focuses its support on promising scientists at the earliest stages of establishing research careers, through its short Undergraduate Vacation Research Scholarship awards; its 4-year PhD Studentships, which include close working with industry; and Medical Research Scotland sponsored Daphne Jackson Fellowships for returners to research. It is not a ‘single-disease’ charity and supports research into any disease or condition. For more information, visit www.medicalresearchscotland.org.uk.